This girl doesn't stay still! Masha Allah, but I cannot leave Iza anywhere without her getting into all the wrong places. 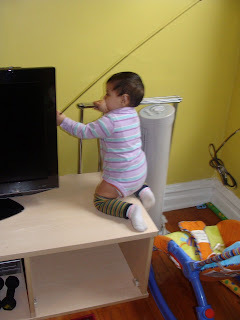 Today she managed to climb onto the console using the chair that was there facing the wrong way. Miss Opportunist saw her chance and used it to get to the rabbit ears she'd been eyeing for a long time.